I had been wanting to try exploring Jamaican cuisine for a while and a jerk spice was the first thing on my to try list. A jerk spice is spicy marinade for meats that primarily consists of allspice and scotch bonnet peppers. I had heard a lot of good things abut the scotch bonnet pepper, mainly being that it was nice and hot, and I had been wanting to try it. The remaining ingredients in the jerk mix can pretty varied. I found a bunch of recipes and picked and chose what I liked from them and I came up with this one. Because the scotch bonnet peppers were supposed to be really hot I started the marinade with just one and tasted it. It was pretty mild so in went a second followed by a third. I was thinking that the spice level would go up as the marinade sat and did its job so I stopped at three. Although the final result was nice and spicy I think I will go with five the next time that I make this. For the first use of the jerk marinade I decided to do a jerk chicken dinner. I Marinated some chicken thighs in the jerk marinade overnight and roasted it in the oven. A nice and simple dish. The jerked chicken was nice and tasty. I really enjoyed the combination of flavours in the jerk spice mix. The jerk seasoning was spicy but not as hot as I would have liked. 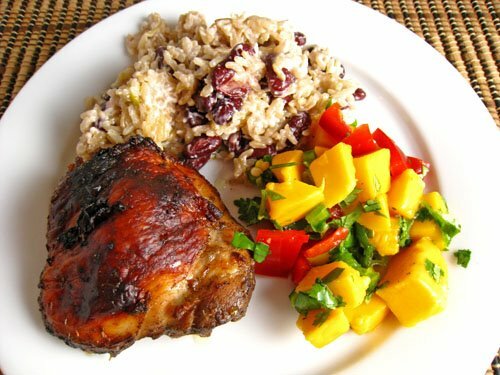 I served the jerked chicken with a simple mango and red pepper salsa to cool things down a bit and some Jamaican red beans and rice . Overall it was a really tasty meal! Bake in a preheated 400F/200C oven for 40-50 minutes turning once in the middle. Looks great, Kevin! I love jerk, and you are my kind of cook with all those scotch bonnets. I think sometimes it’s hard to get the full heat from a pepper in a marinade, but maybe you could boil the marinade you have leftover on the stovetop and then pour it over the cooked chicken for some extra flavor. The red beans and rice look so good, too! Holy moly sir, that is a lot of ingredients for a marinade. It’s sorta like the color white. I recommend you bottle it up and sell it for $10 a jar. Oh, but send me one first for quality assurance testing. Oh yeah, jerk chicken! Wonderful stuff. I’m surprised your peppers weren’t hotter – but I hear that a lot of peppers are being bred to be milder but still sold under the old names. I know jalapenos aren’t what they used to be. Strange, that. LOL @ Nick, he’s got the right idea! I’m sure we’d all love a jar to review. 🙂 Seriously, this looks fabulous. I love jerk. Had some yesterday here at a Jamacian eatry but it is nothing like the one you can from the road-side stands in Jamaica. Yum! You always have the best dinners. Sounds really tasty, Kevin! You did the same thing I always do…look at lots of recipes then pick and choose what sounds good to come up with your own! I haven’t experimented with Jamaican style food yet but I can’t wait to give it a try! I love jerks and this one looks like it would tickle my fancy. Mmmm… this looks delicious. One of my favorite Jerk dishes was served at a mountainside inn in North Carolina. The chef’s specialty was Caribbean cuisine—I’ll never forget that inn or its restaurant, as the food was terrific and the view was out of this world! that looks super good and summery. That whole plate looks so delicious!! I have never tried Jerk spice before. Is it hot spicy or just a bit of heat? I may have to give this a try as your pic is mouth-watering! I’ve heard many good comments regarding jerk seasoning, but I’ve not had it myself. Your list of ingredients include some of my favorite flavors, so I’ll have to take the plunge and try it. I do enjoy spicy, full flavored food; don’t know if I’m brave enough for 5 scotch bonnets! 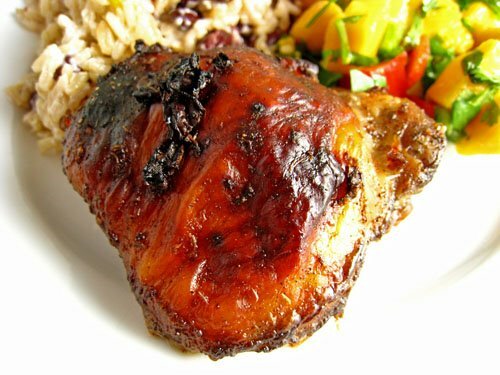 Jerk Chicken is so flavorful and scrumptious! A wonderful dish! That chicken looks perfect! I long to take a big bite out of it! welcome to the world of jamaican cuisine. it’s purdy daggone good, ain’t it? Bridgett: You can easily control the heat by adding the peppers one at a time until it is as hot as you like. wow kevin that sure does look good. The chicken looks amazing. I have one jerk chicken recipe, but this one looks and sounds so much better. What wonderful flavors in jerk chicken. My friend owns this great little carribean restaurant in Ottawa, and man do they make some spicy jerk chicken and great rotis. Yours looks ready for the restaurant. wait a second, kevin. i’m starting to think you did not buy a real scotch bonnet. did you take any pics of the ones you used? i’ve NEVER EVER heard of a mild scotch bonnet pepper. in our jerk recipe, we could barely use a full one b/c they are so intense in heat. there are small peppers that look like scotch bonnet but they are not and have a VERY mild taste. i’m wondering if that’s what was bought? another thing i would recommend for anyone making a good jerk is 1) NEVER ever remove the skin from your chicken. 2) Rub some of your marinade UNDER the skin as well as all over the skin too – wear gloves b/c you do not want to get the scotch bonnet oils into your eyes later on. 3) adding whole scallions to the marinade and pureeing the whole thing w/ more lime juice and a bit of olive oil gives it a mellow garlic/onion flavor too. i’m still baffeled by this scotch bonnet thing! maybe i’m a weakling but they don’t call the scotch bonnet the world’s hottest pepper for nothing! Jerk Chicken perfect for summer. Love the kick – Pair that with a nice cold beer and what a great combo. Would love the recipes for everything else on the plate as well – all looks so good. Here’s a shocker– I’ve only ever had jerk chicken on a PIZZA! Don’t hit me! Now you’ve made me seen the error of my ways! Yum!! I might never get to see a scotch bonnet pepper in this country, though. I wonder if a Thai bird’s eye chili would work, haha. Wow! Looks amazing! Totally got to try this some time! Easily one of the best spicy chicken dishes out there. Your pics are always rocking Kev. oh that chicken looks amazing Kevin!!! you are one amazing chef and I love your awesome photos too! Wow, that chicken sounds good and spicy… The fruit next to it looks so tasty! oooo! It looks so crispy! I wonder where the name “jerk” came from for this spice rub. This is jerk chicken with style. 😀 Looks great Kevin I would savour every item on that plate! Wow I have never tried that, it looks amazing! Can I come live with you!!!! your food is amazing! That whole plate of food looks amazing. I wish I were your neighbor. I would invite myself for dinner. :)I’d bring beer! I’m so lazy, I probably won’t try the jerk chicken, but the rice and beans sounds pretty tempting! That sure looks like a tasty coating on that chicken! I’m with WANF, on the scotch bonnet thing! You had how many? I would have to call an ambulance! That looks amazing Kevin. I love the colour it makes the chicken. This looks really fab! Again, jerk marinade and scotch bonnets are totally new to me. I think it’s time I start googling! Looks wonderful! I’ve had this on my radar for quite a long time, thanks to a couple of posts from last year. Thanks for reminding me, I’m looking forward to it. I have wanted to make jerk chicken. This recipe sounds perfect. I found this site called http://URAjerk.com maybe you can use it. It seems to help get me through the issues of dealing with some of the jerks I know. At least I can vent about these jerks, plus I get a kick out of sending them some cards. I just wanted to let you know that I tried this and it turned out great! Thanks!!! How do you make the rice and what's in it?!? !